Netgear introduced their first product in the Wi-Fi system / mesh category, the Orbi, in August 2016. Its dedicated wireless backhaul (4x4 802.11ac / 1733 Mbps) and 2x2 radios with MU-MIMO support for the clients (on both the router and the satellite) made it one of the best performing Wi-Fi system kits in the market. 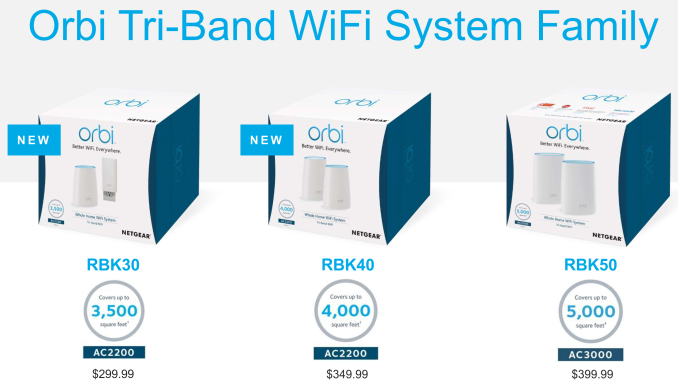 Since the introduction of the Orbi RBK50 (AC3000), various vendors in the Wi-Fi market have come with their own variants. The increasing competition has turned out to be good for consumers, resulting in kits getting introduced at very competitive price points. Many mesh systems come in packs of three, but, Orbi stood out with its claim of being able to blanket a 4000 sq. ft house with just a router and a satellite. Despite the high price (mainly due to additional hardware, compared to a regular router), mesh / Wi-Fi systems have been enjoying very good market reception. 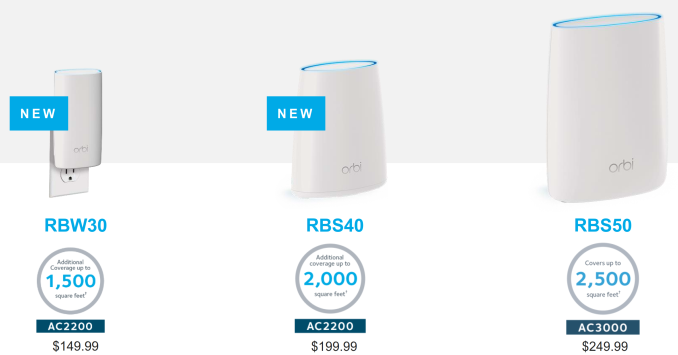 In order to tackle the increased competition (often coming in at a lower price point compared to the Netgear Orbi RBK50 kit), Netgear is introducing two additional members in the Orbi family - the RBK30 and RBK40. Like the RBK50, the main unit and the satellite in the RBK40 are similar in appearance and available interfaces. However, the physical dimensions of the RBK40's components are smaller than that of the RBK50. The RBK40 and the RBK30 share the same router, but, the satellite in the latter is of the wall-plug variety and has no wired ports. The other differences between the three are summarized in the table below. During the press briefing, Netgear emphasized that they support both PC-based and mobile app-based setup for the Orbi. Particular stress was also made on the ability of the Orbi kits to operate effectively without any reliance on the cloud (unlike products such as the Google OnHub that have encountered various issues due to over-reliance on the cloud for day-to-day operation). Netgear is also making the satellites available for purchase separately. The price points for these extenders range from $150 for the wall-plug variety to $250 for the one with the 4x4 backhaul link. The new Orbi products also use the same Qualcomm Atheros IPQ4019 network processor SoC, along with the Wi-Fi SON features. While retaining the same feature set, the RBK30 and RBK40 expand the target market for Wi-Fi systems. The lower price points will also help Netgear in tackling the increasing competition.